The Treaty of Guadalupe Hidalgo (Tratado de Guadalupe Hidalgo in Spanish), officially entitled the Treaty of Peace, Friendship, Limits and Settlement between the United States of America and the Mexican Republic, is the peace treaty signed on February 2, 1848, in the Villa de Guadalupe Hidalgo (now a neighborhood of Mexico City) between the United States and Mexico that ended the Mexican–American War (1846–48). With the defeat of its army and the fall of its capital, Mexico entered into negotiations to end the war. The treaty called for the U.S. to pay $15 million to Mexico and to pay off the claims of American citizens against Mexico up to $3.25 million. It gave the United States the Rio Grande as a boundary for Texas, and gave the U.S. ownership of California and a large area comprising roughly half of New Mexico, most of Arizona, Nevada, Utah, and parts of Wyoming and Colorado. Mexicans in those annexed areas had the choice of relocating to within Mexico's new boundaries or receiving American citizenship with full civil rights. Over 90% chose to become U.S. citizens. The U.S. Senate ratified the treaty by a vote of 38–14. The opponents of this treaty were led by the Whigs, who had opposed the war and rejected Manifest Destiny in general, and rejected this expansion in particular. "Mapa de los Estados Unidos de Méjico by John Distrunell, the 1847 map used during the negotiations. 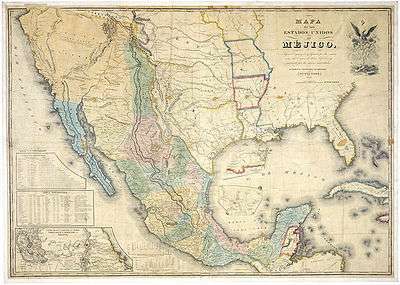 Although Mexico ceded Alta California and Santa Fe de Nuevo México, the text of the treaty did not list territories to be ceded, and avoided the disputed issues that were causes of war: the validity of the 1836 secession of the Republic of Texas, Texas's unenforced boundary claims as far as the Rio Grande, and the 1845 annexation of Texas to the United States. Articles VIII and IX ensured safety of existing property rights of Mexican citizens living in the transferred territories. Despite assurances to the contrary, the property rights of Mexican citizens were often not honored by the U.S. in accordance with modifications to and interpretations of the Treaty. The U.S. also agreed to assume $3.25 million (equivalent to $89.0 million today) in debts that Mexico owed to United States citizens. The residents had one year to choose whether they wanted American or Mexican citizenship; Over 90% chose American citizenship, which included full voting rights. The others returned to Mexico (where they received land), or in some cases in New Mexico were allowed to remain in place as Mexican citizens. Article XII engaged the United States to pay, "In consideration of the extension acquired", 15 million dollars (equivalent to $410 million today), in annual installments of 3 million dollars. The land that the Treaty of Guadalupe Hidalgo brought into the United States became, between 1850 and 1912, all or part of ten states: California (1850), Nevada (1864), Utah (1896), and Arizona (1912), as well as the whole of, depending upon interpretation, the entire state of Texas (1845), which then included part of Kansas (1861); Colorado (1876); Wyoming (1890); Oklahoma (1907); and New Mexico (1912). The remainder (the southern parts) of New Mexico and Arizona were peacefully purchased under the Gadsden Purchase, which was carried out in 1853. In this purchase the United States paid an additional $10 million (equivalent to $280 million today), for land intended to accommodate a transcontinental railroad. However, the American Civil War delayed construction of such a route, and it was not until 1881 that the Southern Pacific Railroad finally was completed, fulfilling the purpose of the acquisition. Mexico had claimed the area in question since winning its independence from the Spanish Empire in 1821 following the Mexican War of Independence. The Spanish Empire had conquered part of the area from the American Indian tribes over the preceding three centuries, but there remained rather powerful and independent indigenous nations within that northern region of Mexico. Most of that land was too dry (low rainfall) and too mountainous or hilly to support very much population until the advent of new technology following about 1880: means for damming and distributing water from the few rivers to irrigated farmland; the telegraph; the railroad; the telephone; and electrical power. About 80,000 Mexicans lived in the areas of California, New Mexico, Arizona, and Texas during the period of 1845 to 1850, and far fewer in Nevada, in southern and western Colorado, and in Utah. On 1 March 1845, U.S. President John Tyler signed legislation to authorize the United States to annex the Republic of Texas, effective on 29 December 1845. The Mexican government, which had never recognized the Republic of Texas as an independent country, had warned that annexation would be viewed as an act of war. The United Kingdom and France, both of which recognized the independence of the Republic of Texas, repeatedly tried to dissuade Mexico from declaring war against its northern neighbor. British efforts to mediate the quandary proved fruitless – in part because additional political disputes (particularly the Oregon boundary dispute) arose between Great Britain (as the sovereign of Canada) and the United States. Before the outbreak of hostilities, on 10 November 1845, President James K. Polk, had sent his envoy, John Slidell, to Mexico to offer the country around $5 million for the territory of Nuevo México, and up to $40 million for Alta California . The Mexican government dismissed Slidell, refusing to even meet with him. Earlier in that year, Mexico had broken off diplomatic relations with the United States, based partly on its interpretation of the Adams–Onís Treaty of 1819 (under which newly independent Mexico claimed it had inherited rights). In that agreement, the United States had supposedly "renounced forever" all claims to Spanish territory. Neither side took any further action to avoid a war. Meanwhile, Polk settled a major territorial dispute with Britain with the Oregon Treaty, signed on 15 June 1846; this avoided a conflict with Great Britain, and hence gave the U.S. a free hand. After the Thornton Affair of 25–26 April, when Mexican forces attacked an American unit in the disputed area with 11 Americans killed, 5 wounded and 49 captured, Congress passed and Polk signed a declaration of war into effect on 13 May 1846. The Mexican Congress responded with its war declaration on 7 July 1846. Map of Mexico. S. Augustus Mitchell, Philadelphia, 1847. Alta California shown including Nevada, Utah, Arizona. The Mexicans proposed peace terms that offered only sale of Alta California north of the 37th parallel north – north of Santa Cruz, California and Madera, California and the southern boundaries of today's Utah and Colorado. This territory was already dominated by Anglo-American settlers, but perhaps more importantly from the Mexican point of view, it represented the bulk of pre-war Mexican territory north of the Missouri Compromise line of parallel 36°30′ north – lands that, if annexed by the U.S., would have been presumed by Northerners to be forever free of slavery. The Mexicans also offered to recognize the U.S. annexation of Texas, but held to its demand of the Nueces River as a boundary. Jefferson Davis advised Polk that if Mexico appointed commissioners to come to the U.S., the government that appointed them would probably be overthrown before they completed their mission, and they would likely be shot as traitors on their return; so that the only hope of peace was to have a U.S representative in Mexico. Nicholas Trist, chief clerk of the State Department under President Polk, finally negotiated a treaty with the Mexican delegation after ignoring his recall by President Polk in frustration with failure to secure a treaty. Notwithstanding that the treaty had been negotiated against his instructions, given its achievement of the major American aim, President Polk passed it on to the Senate. A section of the original treaty. The Treaty of Guadalupe Hidalgo was signed by Nicholas Trist on behalf of the U.S. and Luis G. Cuevas, Bernardo Couto and Miguel Atristain as plenipotentiary representatives of Mexico on 2 February 1848, at the main altar of the old Basilica of Guadalupe at Villa Hidalgo (within the present city limits) as U.S. troops under the command of Gen. Winfield Scott were occupying Mexico City. The Mexican Cession agreed by Mexico (white) and the Gadsden Purchase (brown). Part of the area marked as Gadsden Purchase near modern-day Mesilla, New Mexico, was disputed after the Treaty. The treaty extended U.S. citizenship to Mexicans in the newly purchased territories, before many African Americans, Asians and Native Americans were eligible. Between 1850 and 1920, the U.S. Census counted most Mexicans as racially "white". Nonetheless, racially tinged tensions persisted in the era following annexation, reflected in such things as the Greaser Act in California, as tens of thousands of Mexican nationals suddenly found themselves living within the borders of the United States. Mexican communities remained segregated de facto from and also within other U.S. communities, continuing through the Mexican migration right up to the end of the 20th century throughout the Southwest. Disputes about whether to make all this new territory into free states or slave-holding states contributed heavily to the rise in North-South tensions that led to the American Civil War just over a decade later. The treaty was leaked to John Nugent before the U.S. Senate could approve it. Nugent published his article in the New York Herald and, afterward, was questioned by Senators. Nugent did not reveal his source. In a recent battle between tourists, fishermen, surfers, other members of the public, and venture capitalist billionaire Vinod Khosla, San Mateo County Superior Court Judge Gerald J. Buchwald invoked the 1848 Treaty of Guadalupe Hidalgo to deny public access to a portion of the California coastline. See, Friends of Martin's Beach v. Martin's Beach 1, LLC, San Mateo County Civil Case #CIV517634. Despite the California State Constitution's specific provision enabling members of the public to access the beach, Judge Buchwald ruled that the Treaty trumped the California Coastal Act because it predated it, and officially ended a century of access to Martins Beach in Half Moon Bay, CA. In this controversial ruling, Judge Buchwald found that the treaty, which settled the Mexican–American War, granted the 200-acre beach property to Jose Antonio Alviso before California's Constitution in 1879 established the public trust doctrine that preserved access to such areas for all state residents. 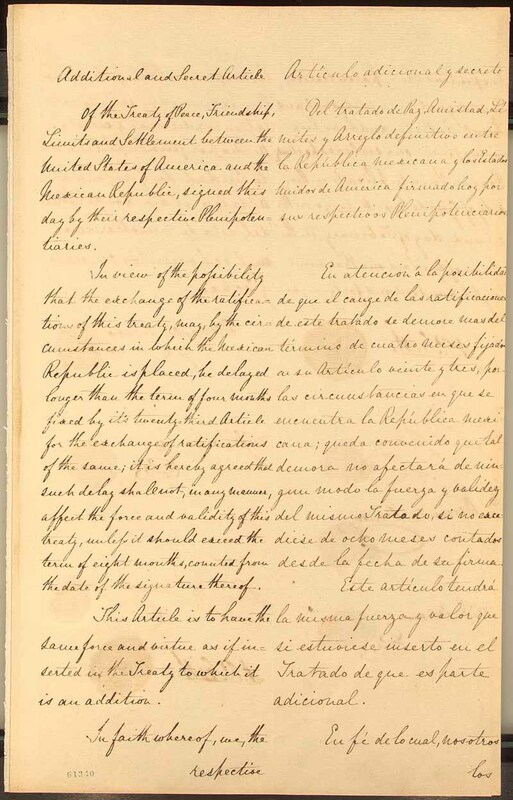 ↑ "Avalon Project – Treaty of Guadalupe Hidalgo; February 2, 1848". Avalon.law.yale.edu. Retrieved 2013-07-08. ↑ "Treaty of Guadalupe Hidalgo". ourdocuments.gov. Retrieved 27 June 2007. ↑ U.S. Congress. Recommendation of the Public Land Commission for Legislation as to Private Land Claims, 46th Congress, 2nd Session, 1880, House Executive Document 46, pp. 1116–17. ↑ Delay, Brian (2007). "Independent Indians and the U.S. Mexican War". The American Historical Review. 112 (1): 67. ↑ Nostrand, Richard L. (1975). "Mexican Americans Circa 1850". Annals of the Association of American Geographers. 65 (3): 378–390. doi:10.1111/j.1467-8306.1975.tb01046.x. 1 2 "James K. Polk's Third Annual Message, 7 December 1847". presidency.ucsb.edu. Retrieved 27 June 2007. ↑ Adams-Onis Treaty, Article III. From: yale.edu. Retrieved 6 November 2007. ↑ "Mexican Argument for Annexation." The Living Age, Volume 10, Issue 123. 19 September 1846. 1 2 3 4 5 6 Treaty of Guadalupe Hidalgo. National Archives. Retrieved 6 November 2007. ↑ "The Treaty of Guadalupe Hidalgo." Library of Congress, Hispanic Reading Room. Retrieved 6 November 2007. ↑ George Lockhart Rives. 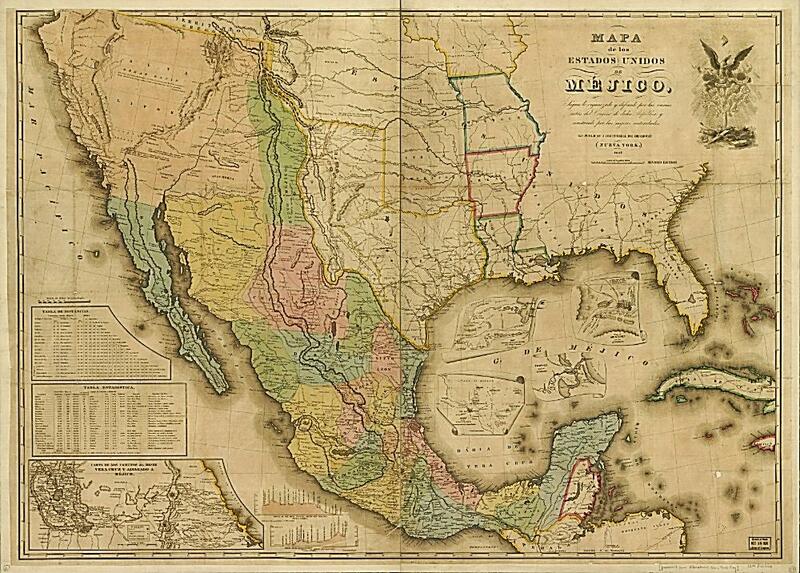 The United States and Mexico, 1821–1848. pp. 634–636. ↑ Online Highways LLC editorial group. "Treaty of Guadalupe Hidalgo". U-S-History.com. Retrieved 2012-03-25. 1 2 Treaty of Hidalgo, Protocol of Querétaro. From: academic.udayton.edu. Retrieved 6 November 2007. ↑ Mills, B. p. 122. 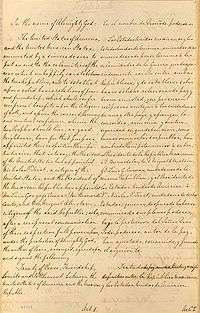 ↑ Treaty of Guadalupe Hidalgo, Article V. From: academic.udayton.edu. Retrieved 7 November 2007. ↑ Gibson, C.J. and E. Lennon. 1999. "Historical Census Statistics on the Foreign-born Population of the United States: 1850–1990." U.S. Census Bureau, Population Division. Retrieved 6 November 2007. ↑ The U.S.-Mexico Border: The Treaty of Guadalupe Hidalgo, John C. Davenport, p. 60, ISBN 0-7910-7833-7. ↑ Barnard R. Thompson. "Mexico's Claim to California Islands – A Never-ending Story". ↑ "Treaty of Guadalpe Hidalgo: Findings and Possible Options Regarding Longstanding Community Land Grant Claims in New Mexico" (PDF). General Accounting Office. Retrieved 5 June 2008. ↑ Robert J. McCarthy, Executive Authority, Adaptive Treaty Interpretation, and the International Boundary and Water Commission, U.S.-Mexico, 14-2 U. Denv. Water L. Rev. 197(Spring 2011) (also available for free download at http://papers.ssrn.com/sol3/papers.cfm?abstract_id=1839903). Griswold del Castillo, Richard (1990), The Treaty of Guadalupe Hidalgo: A Legacy of Conflict, Norman: University of Oklahoma Press, ISBN 0-8061-2240-4 . Ohrt, Wallace (1997), Defiant Peacemaker: Nicholas Trist in the Mexican War, College Station: Texas A&M University Press, ISBN 0-89096-778-4 . Reeves, Jesse S. (1905), "The Treaty of Guadalupe Hidalgo", American Historical Review, 10 (2): 309–324, doi:10.2307/1834723, JSTOR 1834723 .